Moroccan blue is probably the most perfect blue. In Essaouira, an ancient port city located on the Atlantic coast, you’ll see it incorporated into the architecture. The medina is known for its whitewashed buildings and is the perfect backdrop for the warm hue. Essaouira is a laid back place and has some of the coolest looking hippies I have ever seen. They don’t try, they just are. When were you in Morocco Wendy? The contrasting colors look beautiful! I miss Essaouira so much! I know we've only been back a few days, but I truly, truly, truly miss Morocco! This is definitely a place I want to visit when I am based in Europe again...great shot. What a beautiful shade of blue! It's very soothing, I bet that influences how laid-back the hippies are! The brain behind the white/blue color ? Blogtrotter is paying homage to Vilnius as European Capital of Culture 2009. Hope you enjoy and have a great weekend! Hi Priyank, almost 2 years ago. Jen, I bet you do. Catherine, you would love it. Fly Girl, I'm tempted to paint a wall in my apartment this color. Hobo, check out the link in my post. All is explained. Hi Gil, thanks for stopping by. Blue is my favorite color so I would love Essaouira! I grew up in Morocco. This shade of blue has a special place in my heart. Love it. Kristine, what amazing childhood memories you must have. Hi Wendy! 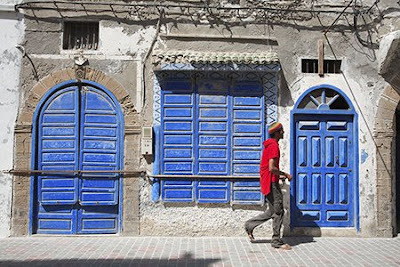 Thanks for the lovely blue door and your post about Essaouira. For three years, we have been hoping to get to Morocco but it didn't happen. It's a big world. Love your work. So vibrant and they really capture the flavour of your destinations. I run a urban photography project website and one of the section is photography of cities of the world. i hope you have time to drop by and perhaps submit some of your work to add to the project.